From David Carson's book "Trek". This shows a mock-up of Still in its original title Quiet. Still (also known as Halo 17 CD2 or And All That Could Have Been: Still), released on January 22, 2002, is both an individual release and the second disc of the deluxe edition of And All That Could Have Been. It contains original instrumentals and stripped down versions of old songs. 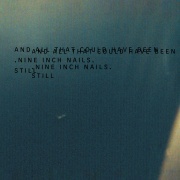 Trent Reznor has stated that some of the tracks on Still are evolutions of rejected themes that were originally written for Mark Romanek's One Hour Photo. The old songs are done in the manner of similar ones performed at the The CRC Sessions. The title may be referencing the Joy Division album of the same name, from which their song "Dead Souls" - covered by Nine Inch Nails during The Downward Spiral era - comes. The album was originally intended to be called Quiet, a name that was later reflected in The Definitive NIN - Quiet Tracks. 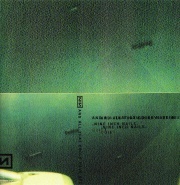 While the album was at one point available as part of the deluxe edition of And All That Could Have Been, it was also offered from the beginning as a standalone disc directly from nin.com. Its availability has been on and off since its release, causing extraordinary prices on eBay at times. The tracks are currently available through iTunes and DRM-free at Amazon.com. Three music videos were made to accompany Still, for the new versions of "Something I Can Never Have" and "The Becoming" and for the new track "Gone, Still". They were all directed by Rob Sheridan. This featured Trent Reznor, Danny Lohner and Jerome Dillon performing at Nothing Studios. The audio for "The Becoming" was the same as featured on the album, though the performance captured in the video did not synch up to the sound and is clearly from a different take. This featured Trent Reznor and Jerome Dillon performing in the living room of Reznor's former home in New Orleans. The performance in this video is not the same as featured on the album. Both the audio and video were recorded solely for this release, though the audio take here is very similar to what was used on the album. The only new song on the release to get a video, this again featured Trent Reznor and Jerome Dillon, performing in the same room as "Something I Can Never Have", with a wind machine in place. The audio is an entirely different take than the one on the album. Executive production: John A. Malm, Jr. for Nothing Records, Inc. This is dedicated to the memory of our friend Rodney Robertson. May you rest in peace. The extended artwork from the iTunes version of the album shows that the cover art comes from an image taken by David Carson from the window of an airplane, as the object on the left appears to be an aircraft turbine and the rest of the image appears to be the ocean below. In late November 2009, Trent Reznor began selling off touring and studio equipment through the eBay account ningear. Several items in the first wave of the auction were spotted as having been used in the recording of Still. The guitar played by Danny Lohner in "The Becoming" is a Takamine acoustic/electric guitar serial number 93040621. Trans wine/cherry finish, featuring a built-in 'accuAcoustic' EQ. A La Patrie "concert" nylon string acoustic/electric guitar, equipped with a EPM Quantum EQ was used in the recording of "Gone, Still" as well as "Something I Can Never Have." Previous release - "Things Falling Apart" Halo number: 17 (with And All That Could Have Been) Next release - "The Hand That Feeds"
This page was last modified on 14 March 2019, at 16:24. This page has been accessed 304,505 times.